Living in Los Angles, party capital of the world, each and every weekend the glitterati line up to get into high profile restaurants, bars, and clubs in Hollywood to see and be seen. Wannabes swoon over pop stars like Paris Hilton, and Lindsey Lohan. Paparazzi are pervasive. As a Physics Groupie, this rank of glitz means little to me. I definitely have my own agenda and my own perspective on who is a superstar worthy of admiration. A couple of years ago Zoe and I attended a physics party for the ages. You’ll see why shortly. We had just attended an all-day Friday series of short talks at Caltech for the Pacific Coast Gravity Meeting 2007. It was an invigorating day providing glimpses at leading-edge research in the fields of quantum gravity, cosmology, gravitational waves, and general relativity. 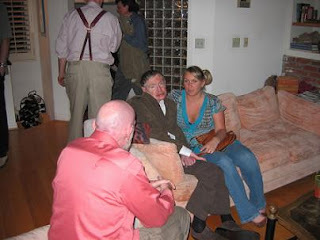 At the end of the day, the attendees had quite a surprise as the organizers passed out flyers announcing a party for the group to be held at Professor Kip Thorne’s house up in the Arroyo Seco area of Pasadena just above the Rose Bowl. The flyer included a map to the location (which I saved for prosperity). The invitation was totally unexpected as the conference information never mentioned a party. Zoe and I looked at each other in heated anticipation. We’d never been to a physics party before. Of course we’re going! We drove over to Kip’s beautiful hillside home and found a rousing party taking place. Hollywood, eat your heart out! The rooms were filled with Caltech grad students, postdocs, and faculty in addition to all the visiting researchers from around the country and the world. Zoe and I felt an electric fascination with everything going on. The party was ordinary in the sense that guests were milling around the catered meal and drinks in the kitchen, as small groups gathered in the living room and sun deck. We listened with interest to various conversations and then strolled down to the fire pit out back near the pool and Jacuzzi. Here we found the same physics crackpot we encountered earlier that morning schmoozing up to Professor Thorne in the Jacuzzi. We also witnessed a female grad student disrobe to her underwear to take a swim. Everyone was having a wonderful time. Zoe and I sat alone next to the fire pit and talked about how amazing it was to be at a physics party at Kip Thorne’s house. Little did we know the best was yet to come. As we began to make our last rounds about the house, we passed by the living room and kitchen area one more time where we noticed a commotion. From across the room I noticed an oddly familiar wheelchair next to the food table. I thought to myself, “It couldn’t be, it just couldn’t be.” I felt flummoxed as I walked briskly over to the table to identify the newly arrived guest. It was! It was none other than Stephen Hawking, the Lucasian Professor of Mathematics at Cambridge University. Zoe and I were beside ourselves. Here, just inches from us was the most preeminent physicist in the entire world. Wow! We watched as one of the very responsible assistants of Professor Hawking helped with his dinner that included sips of Chardonnay from a spoon. After the professor finished eating, I found out what a brilliant physicist has for dessert. Another assistant repeatedly held up small yellow Post-it notes in Hawking’s field of view. I saw at least half a dozen displayed for him. He would signal when he was finished with one, and ready for another. It was an intriguing process that was designed to address his limitations with having ALS (Amyotrophic Lateral Sclerosis, or Lou Gehrig’s Disease). He was reading notes from other researchers that included equations! Imagine such a mind that was able to digest mathematical equations in that manner. I was in awe by the whole concept. After the party, I relished what had transpired that night. It was perhaps the most memorable party I will ever attend. For a Physics Groupie, could it get any better?